Procedural level generation for games is an active field of research with successful applications. However, how to generate content that embodies design intent is still an open research question. Level designers lack abstractions and tools for authoring generated artifacts for affecting emotion. We propose a novel pattern language for generative level design inspired by Appraisal Theory. Its patterns enable designers to add meaning, depth, and cohesiveness to the resulting content, and modify artifacts to make the content more engaging. We illustrate how these patterns can be implemented in a generative grammar for level generation for an adventure game. Formative evaluation of generated level content demonstrates the feasibility of the approach and suggests points for further improvements. Future work could focus on other elements which seem important for affecting emotions, including pacing, perception, and expectation. Corstjens, R, Bouwer, A, Dormans, J, & van Rozen, R. (2018). 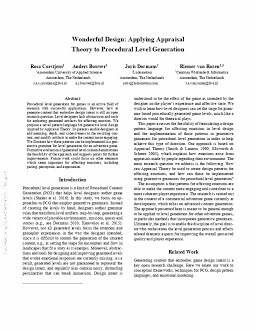 Wonderful design: Applying Appraisal Theory to Procedural Level Generation. In AIIDE-WS 2018. Joint Proceedings of the AIIDE 2018 Workshops.